Restored and remastered from studio elements, this deluxe limited edition release of 1500 Units features some of the best television music ever recorded, much of it never-before-released, from such renowned composers as Lalo Schifrin, (who wrote the iconic theme), Gerald Fried, Jerry Fielding, Don Ellis, Richard Hazard, Robert Drasnin and more! Album producer Jon Burlingame takes you on a thrilling mission through this deluxe compilation and its amazing scores with his comprehensive liner notes – delivered via three informative, photo-packed booklets. The 6-Disc set is housed in an attractive hard-cover slipcase. 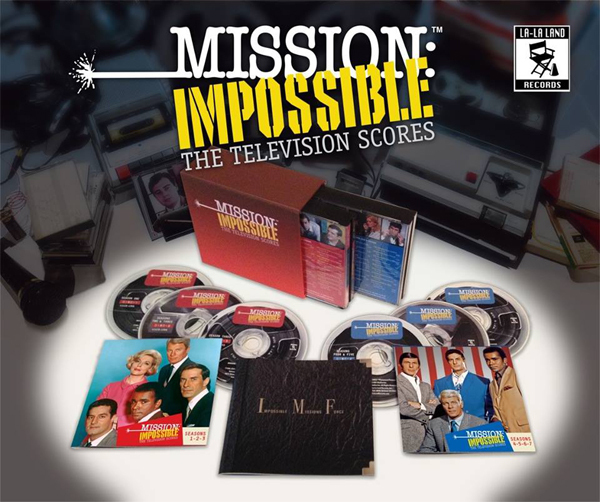 Limited to 1500 units, MISSION: IMPOSSIBLE – THE TELEVISION SCORES will be available for order from www.lalalandrecords.com starting July 28, 2015 (12 noon PST) and will commence shipping out to customers on August 10, 2015.